Yarn poms just make me happy. 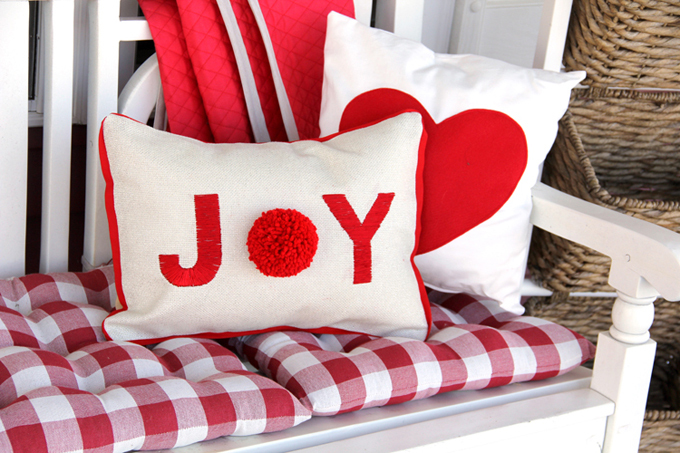 And what better way to share that happiness, than by making a JOY pillow using poms? The ball shape of the pom replaces the ‘O’ in joy, making an absolutely adorable pillow for Christmas. This project is handmade holiday decor that will keep you smiling through the entire month of December. Step Two. Place embroidery hoop around one letter and thread your needle. Step Three. Start filling in the center of the letter with your desired embroidery stitch. Repeat for both letters. Step Four. Iron canvas on gentle setting to remove wrinkles. Step Five. Following the instructions on the pom maker, make one 2.5” pom. Make sure to make the pom extra full by wrapping the yarn around the pom maker over and over again, until the pom maker side is almost too hard to close. Step Six. Using a needle and thread, sew the pom directly onto the center of the canvas. Make sure to go up and over the pom when you are sewing, pulling the thread tight, to secure. If needed, trim the pom yarn with scissors to make a nice round ‘O’. Trim pillow front canvas around the side edges evenly, until your front canvas pillow is 13”L x 17”W. *Optional Trim, Step Seven. Add piping or other trim around the outer edge of the front pillow canvas by matching up the raw edges and sewing around using a baste stitch ⅛” away from the edge. Step Eight. Fold one 13”L side edge of the cotton pillow back side ¼” toward the wrong side and press. Fold again ¼” and press, sew. Repeat for other cotton pillow back. Overlap the sewn side edges, until the entire width of the pillow backs together is 17”. Pin overlapped edges and baste stitch ¼” away from the edge to secure in place. Step Nine. Place pillow front and back right sides together and pin around all sides. Sew using a ½” seam allowance. Clip corner seam allowance. Step Ten. Turn right side out, push out corners and press. Insert pillow form into pillow and enjoy!